The deadline to register for the Race for the Cure is just days away. The last day for team registration is Thursday, April 21. The race will be held on Saturday, May 14 at 8 a.m. in downtown Columbus. The registration fee is $30. For more information about the race, visit www.komencolumbus.org. If you are unable to join us for the race, but you would like to make a donation to support the cause, you can do so by clicking here. Your involvement will make a difference. Seventy-five percent of any donation received supports local breast cancer education, screening and treatment services, while the remaining 25 percent supports global scientific research to find a cure. To register for Team Quality Corner, click here. Everyone is welcome to join Team Quality Corner. The more, the merrier! Hurry, registration will end soon. We'll see you on May 14! New from Harlan Coben - "Live Wire"
"Myron Bolitar's family takes center stage in this new Coben thriller. Former tennis star Suzze T and her rock star husband, Lex, are both clients, and now Lex has disappeared and a very pregnant Suzze is in tears. Myron is forced to confront deep secrets in Suzze's past, his family's mortality, and before "Live Wire" is over, his own." "Harlan Coben is the modern master of the hook-and-twist - luring you in on the first page...only to shock you on the last." Live Wire is available in print and audio at The Quality Corner. Click here to purchase your copy. Shawn Corey Carter, better known as Jay-Z, is a rapper and businessman. He is one of the most financially successful hip hop artists and entrepreneurs in America, having a net worth of over $450 million as of 2010. He has sold approximately 50 million albums worldwide and has won thirteen Grammy Awards. I have never been a fan of his music, but I admire his success and entrepreneurial spirit. I watched Jay-Z's Master Class on the Oprah Winfrey Network (OWN). I really appreciated his humble attitude. He hasn't forgotten where he came from. He acknowledges that his past has made him what he is today. Considering the fact that he was raised in the projects of Brooklyn, it truly is amazing to see where his is now. He's not ashamed of his roots. He is happy to share his story and help others. "I'm not a businessman - I'm a business, man." Some people think Jay-Z is just another rapper. Others see him as just another celebrity/mega-star. The reality is, no matter what you think Jay-Z is, he first and foremost is a business. And as much as Martha Stewart or Oprah, he has turned himself into a lifestyle. But despite Jay-Z's success, there are still many Americans whose impressions of him are foggy, outdated, or downright incorrect. Surprisingly to many, he honed his business philosophy not at a fancy school, but on the streets of Brooklyn, New York and beyond as a drug dealer in the 1980s. Empire State of Mind tells the story behind Jay-Z's rise to the top as told by the people who lived it with him - from classmates at Brooklyn's George Westinghouse High School; to the childhood friend who got him into the drug trade; to the DJ who convinced him to stop dealing and focus on music. This book explains just how Jay-Z propelled himself from the bleak streets of Brooklyn to the heights of the business world. Zack O'Malley Greenburg draws on his one-on-one interviews with hip-hop luminaries such as DJ Clark Kent, Questlove of The Roots, Damon Dash, Fred "Fab 5 Freddy" Brathwaite, MC Serch; NBA stars Jamall Crawford and Sebastian Telfair; and recording industry executives including Craig Kallman, CEO of Atlantic Records. * The feature movie about Jay-Z and his first basketball team that was filmed by Fab 5 Freddy in 2003 but never released. * The Jay-Z branded Jeep that was scrapped just before going into production. * The real story behind his association with Armand de Brignac champagne. * The financial ramifications of his marriage to Beyonce. 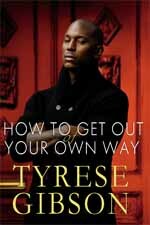 New Book by Tyrese Gibson - "How To Get Out Your Own Way"
Tyrese Gibson is an actor, R&B singer, former fashion model, and now an author. Tyrese was raised in Los Angeles, California by a single mother. His career began when he won a talent show at age fourteen. An appearance in a Coca-Cola commercial singing "Always Coca-Cola," led to wider fame. I remember that commercial so well. It's hard to believe that was almost twenty years ago! The 32-year-old star is shining in a different way now. His new book, How To Get Out Your Own Way, is a memoir and inspirational guide. The book is organized into a series of questions that helped Tyrese redefine who he was and to evolve as a man. It is a guide to helping yourself, using his experiences as a learning tool. Last week, I had the privilege of participating in an online press conference with Tyrese. He spoke with Linda Duggins, Director of Multicultural Publicity of Hachette Book Group and he took questions from reporters. He was very candid about why he wrote the book. He really desires to inspire people to be the best that they can be. He spoke about how, as a youth, he was inspired by everyday people that successfully faced challenges - his mother, neighbors, etc. He wants to use his success as a way to reach out to people. Fans may see his picture on the cover of his book and pick it up because they admire his talent. However, once they begin reading it, they will receive a powerful message. I was impressed by how sincere Tyrese was during the press conference. He was very down to earth and he has a lot to say. I think this book will accomplish his goal of inspiration.